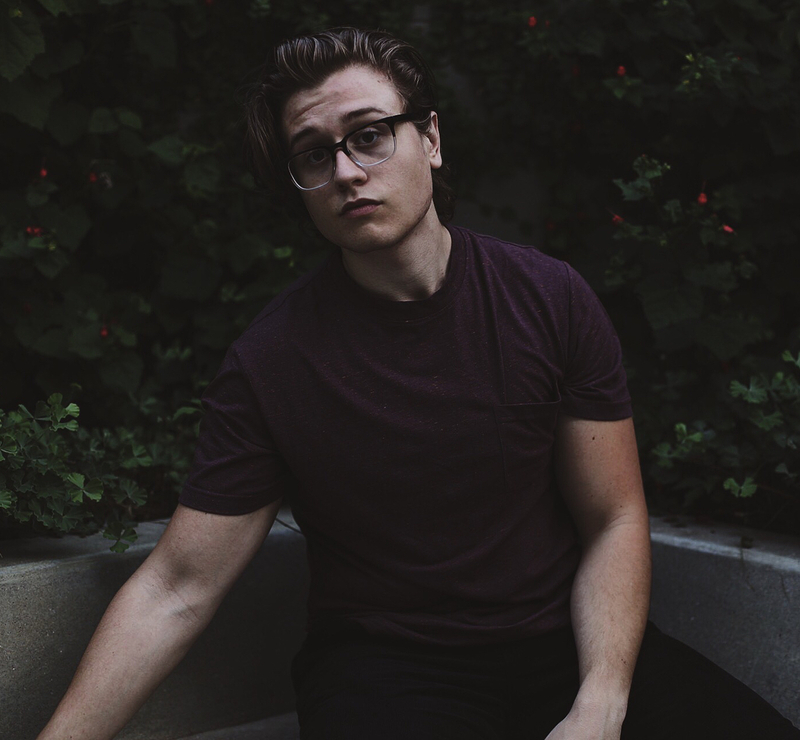 Before we get started I just wanted to say that I was nominated for Best Up-and-Coming Young Paleo Blogs in Paleo Magazine and would really appreciate it if you took a quick moment and voted for me here. You can also vote for all your other favorites there for best new cookbook and what not so it should be a pretty fun time. There is even a favorite cooking fat vote; I chose ghee but my mom chose butter, needless to say we’re a butter loving family I guess. Any who, Boeuf Bourguignon or more commonly known as Beef Bourguignon was first introduced to me through the wondrous and amazing cookbook Mastering the Art of French Cooking by Julia Child. 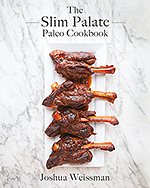 Flipping through many of her recipes you might actually notice how many of her recipes happen to actually be incredibly nourishing and healthy, in fact even Paleo! My assumption is because our wonderful friend Julia actually knew what food is. Speaking of how wonderful Julia is she also happens to be one of my biggest role models. With simple yet gorgeous recipes she managed to make a massive wave in the culinary world that still resonates to this day. Rarely do I ever meet someone that genuinely likes food and doesn’t know the name Julia Child. Her recipes are almost seamless and this one is a personal favorite of mine. I’m not trying to get all Julie and Julia on you here, I’m just saying that Julia Child is awesome. 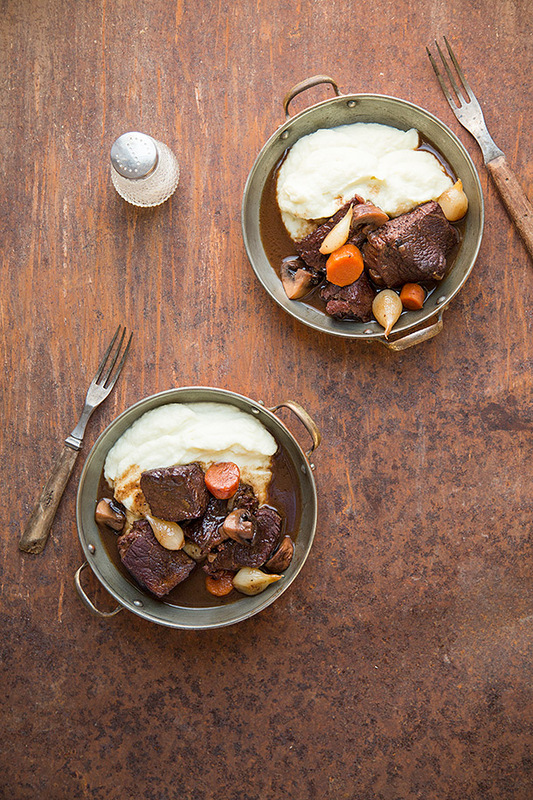 In her recipe for boeuf bourguignon she managed to create a recipe that has layer upon layer of perfectly balanced flavors that melt away in every bite. If you just close your eyes you can actually search around and find those little nuances that she tossed in there and you can tell that each little trick was intentional because she was an absolute genius. Now I of course made some changes to the recipe to fit the way that I like things to taste but no need to worry because each change I made was fairly subtle and only adds a touch of my own style of cooking. 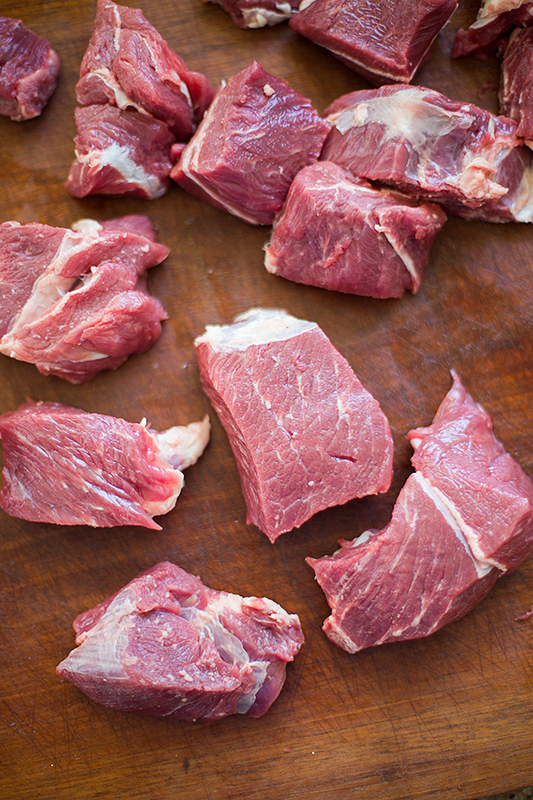 I choose to use cubed chuck roast because it does best when being braised for this period of time. I’ve tested other cuts but chuck by far has been the best and most forgiving. Everyone who got the chance to try it was more than satisfied, and with the creeping cold setting in now is the perfect time to start making something as warming and delicate as this. It was a particularly cold day when I made this in fact so when my parents and I sat down for dinner our entire conversation consisted of groans of satisfaction and ended with empty plates. Yet again Julia had not failed me and there was yet another successful meal on our table. 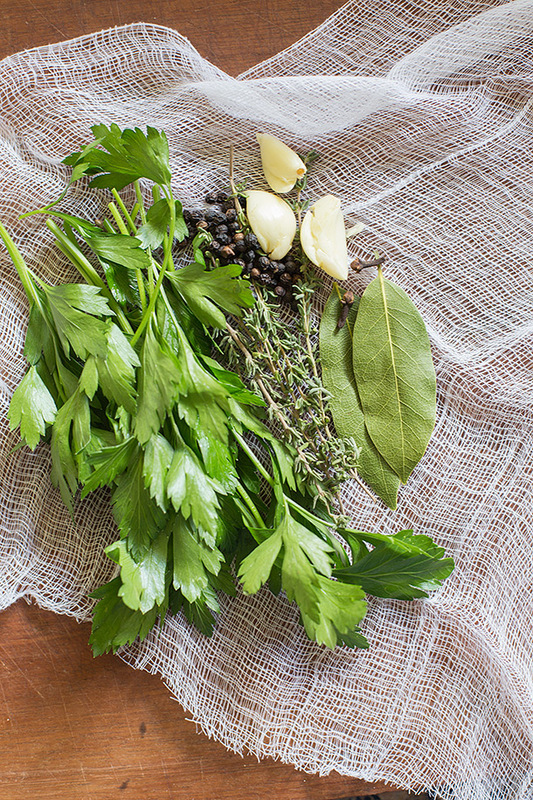 Place all ingredients for the bouqet garni in a large cut out of cheese cloth and tie shut to create a tied off bag so none of the ingredients can escape. In a large pot or dutch oven cook the bacon over medium heat until slightly crispy and well browned and place to the side but leave the bacon fat in the pot. Add ½ tablespoon ghee or less depending on how much bacon fat is left in the bottom. Increase the heat to medium high heat. Once it's hot season the meat with salt and pepper then brown for 2-3 minutes on all sides in batches placing each browned piece of meat on a dish tented with foil to avoid over crowding the pan. Once all of your meat is browned turn the heat to medium and add remaining tablespoon of ghee to the pot. Once the ghee is hot add yellow onion and carrots and cook for 2-3 minutes or until the onions begin to soften then add the tomato paste, stir and cook for 1 more minute. Pour in the red wine while scraping the bottom of the pot with a wooden spoon and season with salt and pepper. Place the browned meat back in the pot along with the juices from the dish they were placed in and the bacon. Pour in the beef stock to the point where it almost covers the beef (you may or may not use the whole cup). Place the bouqet garni into the pot making sure it's completely submersed in the liquid. When there is an hour of coking time remaining bring a pot of water to a rolling boil and add the pearl onions. Boil the onions for about 1 minute then drain the water out, peel them and cut off their roots. Melt 1 tablespoon of butter over medium heat in a medium sized pan. Add the pearl onions, season with salt and pepper and saute for 2-3 minutes or until they are browned on the outside. 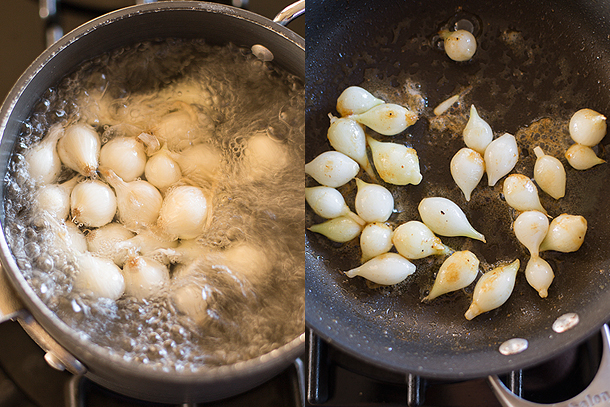 Place the browned pearl onions in a bowl and then melt remaining ½ tablespoon of butter in the same pan. Increase the heat to medium high, add the mushrooms, season with salt and pepper and saute for 1 minute then reduce the heat to medium and continue sautéing for 2 more minutes then turn off the heat. When there is 25 mintues left for cooking take the lid off, add the pearl onions and mushrooms and place the lid back on; cook for the remainder of the time. 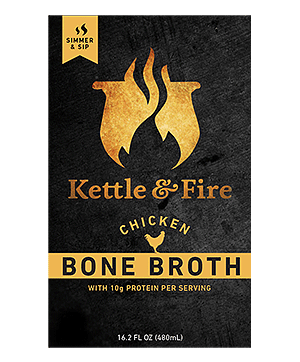 Serve with cauliflower mash or regular mashed potatoes, up to you. All I have to say is that I ain't afraid of no starch. Well there I don’t know what your stew meat could be made from. Sometimes it’s made from chuck roast but it can also be made of brisket, plate, etc. If I would suggest using one of your chuck roasts to be on the safe side. Either that or you can call your source for the meat and ask them what cut they use in their stew meat. Would any of this recipe change if I were using a slow cooker rather than a dutch oven? I do NOT recommend making it in a slow cooker. You need the high searing heat in the dutch oven for the beginning steps to get the caramelized, complex flavors. You physically cannot replicate that with a low-temperature slow cooker. It will be cooked but it won’t do the recipe justice because you will not get the amazing flavors that a Dutch oven provides. If you don’t have a Dutch oven, Amazon sells an enameled 6-quart Lodge model that is excellent and way cheaper than the Le Creuset type of brands. Palate-perfection images here!….Question…would you (or your readers?!) 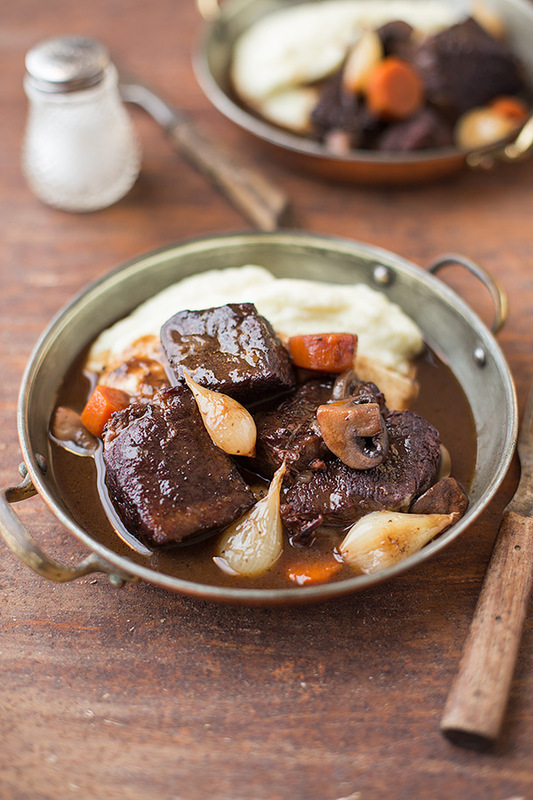 know of the French equivalent of the cut of beef called for?..Would it be paleron?….I need to obtain a chart of cuts of meat (French/US) for beef, lamb, pork and chicken…This bourgignon looks spot-on authentic and succulent…Thanks so much for sharing with clear, fantastic explanations…helps a great deal!! I’m not sure paleron is the exact same cut as a chuck roast but it might work the same as it comes from a similar area. Julia Child is awesome! Love her recipes. This is currently simmering in my Dutch oven….the whole house smells amazing! I snuck a taste and it’s delicious!!!! Nothing better then a hot stew on one of the coldess winter days to date. A whole bottle of wine … not a good option for me. Is there a substitute that can be used in place of the wine? Thank you! The alcohol in the wine is cooked out. You can just substitute all stock but then it will no longer be boeuf bourguignon.